In today’s world of ever-accelerating innovation, nimble challengers spring up and disrupt business overnight. Keeping pace with the competition and ensuring long-term market relevance can be a daunting task. The one certain in a thick of uncertainty is that the decision to harness the power of digital to drive business results and ensure long-term market relevance is no longer a question of if, but a question of how. “Digital Transformation” is the latest fad to sweep over the IT industry. Except it isn’t a fad, and it isn’t just about IT. Digital Transformation is the strategic decision to embrace the power of digital technology as integral to the success of every aspect of the enterprise. It is about survival in today’s business world and is the key to long-term sustainable success as the pace of innovation continues to multiply. 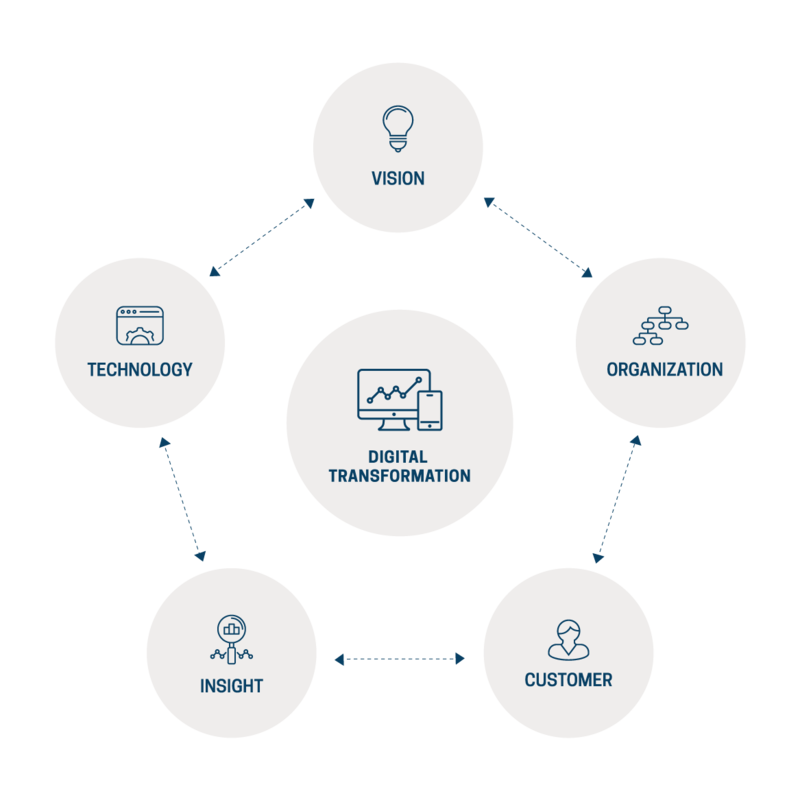 In order to achieve full Digital Transformation, an organization must be focused and aligned on five key elements: Vision, Organization, Customer, Insight, and Technology. Vision is the element that points the company in a unified direction. Crafting an effective North Star vision statement is paramount to corporate success. A vision statement should be audacious, motivational, and leave no doubt as to what the company intends to become. But in order for vision to achieve desired business results, it needs to be integrated into every aspect of how the Organization thinks and acts. Every individual in every department of the company must understand the vision and feel accountable for contributing to its attainment. This requires an appropriate organizational structure, culture, processes, skills, and incentives. It requires everybody pulling in the same direction at all times. That direction needs to be pointed toward the Customer. “The Customer Comes First” isn’t just an overused, hollow slogan, it must be an innate part of the culture. All teams must understand their customer, embrace customer needs, and solve customer problems as the main driver to their work. A thorough understanding of the company’s customers comes through Insight. The digitally transformed organization does not make decisions based on politics, gut feel, or personal opinions. It has a culture and leadership style that relies on big data, advanced analytics and integrated systems of insight to continuously develop and test new insights. Obviously, Digital Transformation requires the right understanding, implementation, and commitment to Technology, but there’s a reason this is mentioned last. Technology on its own is not a silver bullet. Knowing how to leverage technology to enable an insights-driven business, instead of viewing it as a cost center, is the final and most crucial piece to the puzzle. This knowledge can only come from alignment with the other four elements of the model. In order to answer that question, you need to know what your company’s current capabilities are within each of the five key elements of a successful Digital Transformation program. 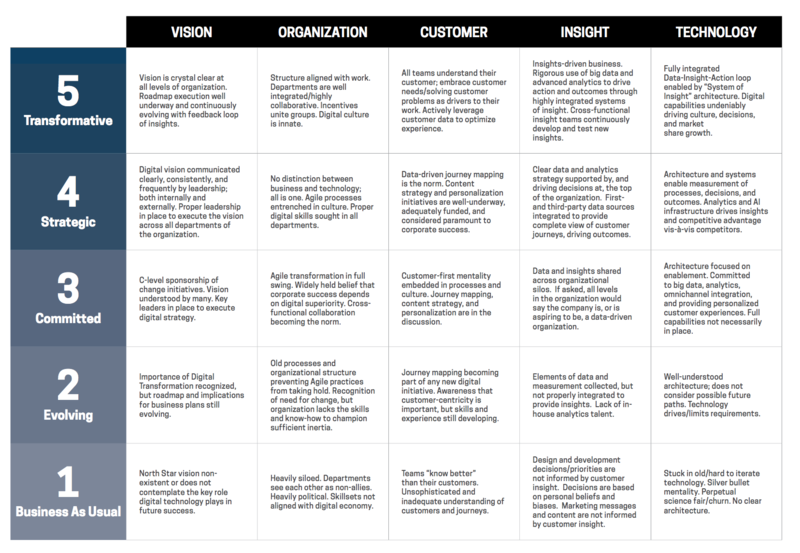 A Digital Capability Assessment interview helps evaluate your organization’s maturity level along these five core competencies and provides the insight necessary to prioritize investments, shore up organizational proficiencies, capitalize on opportunities, and develop a detailed roadmap for your transformation journey. Recent history is littered with examples of market leaders who failed to change with the times and are now afterthoughts in their industry. When is the last time you thought about using a Polaroid camera, paper map, Encyclopedia Britannica, or a Yellow Pages phone book? These are just a few examples of companies that saw change on the horizon but thought they could weather the storm with small adjustments around the edges. Digital Transformation requires bold vision, unmistakable organizational alignment, thorough customer awareness, highly integrated systems of insight, and superior application of technology in order to stand out in the rapidly evolving marketplace. The next move is yours. Will you write the next chapter in your organization’s history, or become a footnote in tomorrow’s business journals?